The leader of the American Muslim organisation Nation of Islam, Louis Farrakhan, says he is seriously ill. In an open letter to members, the 73-year-old said he was suffering pain like that he had felt in 1998 when he was diagnosed with prostate cancer. He requested that his followers carry on with his movement after his death. He supports African-Americans having their own nation and is regarded as one of the most controversial and charismatic African-Americans alive. He has also been accused of being an anti-Semite. He revealed his health problems in a letter on Friday to Nation of Islam members in its newspaper, the Final Call, in which he compared his health problems to those of Fidel Castro. The letter, also published on Nation of Islam's website, goes into graphic detail about his fight against "serious pain". He announces that he is "postponing indefinitely all engagements, meetings and appointments". "In this period of testing, you can prove to the world that the Nation of Islam is more than the charisma, eloquence and personality of Louis Farrakhan," he said. Lawrence Mamiya, a professor of religion and Africana studies at Vassar College, in Poughkeepsie, New York, said that Mr Farrakhan's death could strain the organisation. "Through [its] history, the death of a leader has meant a number of divisions," he told The Associated Press. 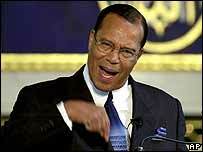 Louis Farrakhan has inspired strong feelings as leader of Nation of Islam. What do you think the implications of his poor health are for the organisation? Farrakhan has developed a clear cult of personality around himself, though not to the degree of many charismatic leaders like Chavez or Hussein. Nevertheless, the Nation of Islam depends greatly upon him as a vociferous and forceful leader. Should his health worsen, the Nation of Islam will be without an ever-present symbol that has legitimized and propelled them since their palpable entrance into the public intellect - the Million Man March; the integrity of the organisation will be put into significant jeopardy should Mr Farrakhan fall into worse health. These self-appointed "black leaders" have led so many black Americans astray by encouraging them to wallow in our supposed victimhood, while living in fabulous luxury. Outside of America, they have supported every known tyrant and kleptocrat, regardless of how they treat our longsuffering people. Even the overtly racist Gadaffi is shamelessly lionized. This is just another measure of how much they believe in so-called "black emancipation." A man of Mr Farrakhan's calibre will be missed, especially to the Afro-American and the black community as a whole. Despite differences in religious affiliations, Mr Farrakhan has created awareness among many people, especially in the black community. In many instances, he tried to educate the black community on many issues that are of great benefit to them, educationally. Since some of us cannot think for ourselves, Mr Farrakhan tries to tell us we have to start thinking and to start talking for ourselves. As some of us are mentally messed up, we need someone like Mr Farrakhan to administer our doses to us. I hope he will recover soon. Like all humans, Farrakhan is mortal. Nevertheless, whatever his detractors and enemies may say, he has forced Africans world-wide to confront the unpleasant truths of their position in the world and has unerringly sought to guide and lead towards betterment of that position. Among oppressed people, Farrakan's legacy is assured. Like Malcolm X and Marcus Garvey his example will burn forever in our consciousness. I have no use for either Islam or Christianity, but Farrakan's core message to me supersedes both faiths in its relevance for black people. His organization will survive and regenerate. As an African-American, I can honestly say that I care nothing for Farrakhan and those that ally themselves with him. His message is one of division and separatism that no longer has a place. It is neither practical nor will it solve any of our problems. I hope that with his passing, so too will pass the Nation of Islam. I believe that Mr Farrakhan is a remarkable product of his time, but the question of who can follow in his footsteps remains. Few people can maintain the status he has while at the same time straining the credulity of those who are not his ardent supporters, as he has also done. My guess is that his movement will suffer for his absence, as will the begrudging respect many bequeath to him because of his stature as an (in)famous public figure. His critics will probably outweigh his inevitable gaggle or hagiographers when the historians pick over the remains of his deceased public persona. NO doubt he will remain a cult figure, even hailed as a martyr, even while others think otherwise and most will forget all about him in less than half a decade. I have not necessarily been a fan of Mr Farrakan's. However, he's stood strong for African-American Muslims. If the United States is ever to find a balance in the Israeli-Palestinian conflict, it must start with American Muslims, like Keith Ellison, winning seats in the House of Representatives. Only then can the average American see and hear Muslims articulating their side of the story on Palestine, and other issues of interest to Muslims. As African-American Muslims are 42% of the 7 - 8 million Muslims in the US, they will play a critical role in future politics at the House of Representative level. Farrakan's passing will be in the same general time frame, I suspect, of Keith Ellison's rise to the House as the first American Muslim representative. As a Afro-Amer who lives in the city that the Nation Of Islam is based, it is with sadness that I hear of Mr Farrakhan illness. He is a powerful speaker, who has touched the lives of countless young people, particularly young afro Americans in mostly black colleges, where he has been a featured speaker for years. He has inspired and motivated, given a sense of pride, and displayed what it is to be strong in the face of difficulty. While most of us have never followed him into his religion, most have benefited by his messages. Unfortunately, Farrakhan and the Nation of Islam do not represent true Islam and only serve to further confuse and distort the line between what average, everyday Muslims believe and what other off-shoot extremist organizations believe. Of course the Nation has every right to preach what it wants, but Americans and the rest of the world should shoulder the responsibility of researching and educating themselves as to the differences between the Nation and true Islam. The main problem in the modern world is that of abusive institutions whether they be American military misadventure or corporate exploitation. To his credit Mr Farrakhan spoke out against said abuse. As with any man, he had many faults but the lack of a clear world view was not one of them. As these audacious figures borne of the civil rights era pass from the stage of time and are replaced by the modern no-opinion, pandering, play-it-safe journalists, commentators and columnists, we shall have lost something. Farrakhan is a misunderstood hero. His legacy will last for generations in the black and Muslim community. He is one of the last great black leaders and he will be missed. Whether he is succeeded by men of cunning and power, or men of faith and generosity, or even a woman will reveal the degree to which politics, power, virtue, faith and equality were manifest in his leadership. The apple shall not fall far from the tree. If an organization falls apart because its charismatic leader is no longer strong enough to manage it or support it, then it does not say much about the strength or structure of the organization does it? It just proves how a monopoly and control by one person can cause much damage and friction when the leader is no longer able to hold it together. I have absolutely nothing against the Nation of Islam, but if Mr. Farrakhan goes, then I see no future for it. It will fracture and fall by the wayside.